In January of 2010 a meeting was called to discuss formation of the Delano Community Farmers Market. A corporation was formed, an organization was created and the market opened on May 5th for a successful season. The Delano Market is a small, weekday, urban market with a mission to provide fresh, locally-grown food to Delano and the inner city. In 2011 the market ranked #1 in Kansas and #19 nationally among small markets in America's Favorite Farmers Market campaign. The market is held from April - October every Wednesday evening from 5:00 - 7:00 p.m. at the Senior Center - 200 S. Walnut. The Last Harvest Party (final market of the season) is always a party! It is the last chance to get fresh vegetables for the adults and a guarantee of candy for the kids! In 2013 the market was moved to Lawrence-Dumont Stadium and was operated as a satellite market for Kansas Grown, Inc. In 2014, Kansas Grown decided they did not want to operate the market. We are currently working on acquiring a suitable permanent location for the market and hope to re-open. 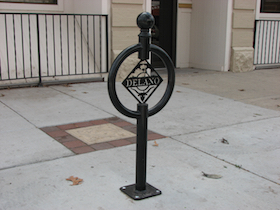 In the spring of 2010 we began work with the City to provide bicycle racks for Delano. The initial plan is focused along West Douglas but will be used as a model for future expansion. 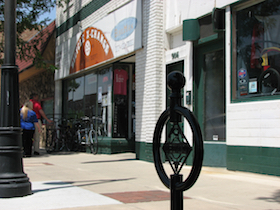 The plan calls for over 200 bike racks to be installed along Douglas from the river to Vine in 9 phases. The first two phases have been funded and installed. Future phases and funding options are to be addressed annually. 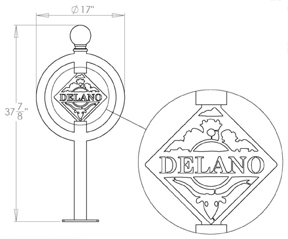 Delano, Downtown, Old Town and the Douglas Design District worked together to create Shop Douglas, Inc. The purpose of the collaboration is to encourage people to shop local. Shop Douglas organizes the 2nd Saturday Shopping Spree each month. 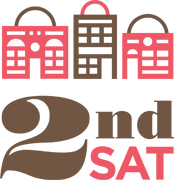 Shoppers purchase a reusable 2nd Saturday shopping bag and receive discounts at participating merchants along Douglas Avenue. Representatives from the Delano Neighborhood Association, Delano Clergy Association and Historic Delano formed a Steering Committee to establish a Community Development Corporation (CDC) for Delano. The CDC will work to implement various portions of the Delano Neighborhood Revitalization Plan as well as coordinate activities and efforts between the various groups in Delano. The Great Delano Flood of 2010! On December 16th, 2010 at around 12:45 a.m. a water main blew out under the intersection of West Douglas Avenue and Handley Street. The resulting fountain of water flooded several blocks of Douglas as well as several side streets as it flowed south towards Maple Street. A view down Douglas Avenue from just west of Handley Street. The new Douglas Avenue Fountains at work! A little blurry, but check out the trash can on the right.